Vinowall Wall Mounted Wine Rack - The modern wine storage solution! The Vinowall wine racking system is the modern way to store your wine, directly onto your wall! Vinowall is brand new to the UK and is made in the wine loving country of South Africa. The Vinowall system allows you to show off your wine collection in style with a stunning visual display hanging from any internal wall in your home! The Vinowall can be placed in your home or restaurant / bar and your wine collection will seemingly float in mid-air with each piece holding up to 12 bottles. The modular wall-mounted wine rack is designed to display your wine collection big or small, in a modern yet functional way. The black and white designs means they look great in one block colour or used alternatively side by side or as rectangle. Why use the Vinowall Wine Rack System? Each Vinowall wine rack is measured at 295mm high, 450mm wide and 180mm deep which includes both the main panel and ABS plastic prongs. The main panel is made from an aluminium composite which is available in either black or white, perfect for any indoor décor! If you place a Vinowall next to each other, you’re able to utilise an extra bottle hole, meaning two Vinowall’s side by side will hold 27 bottles. 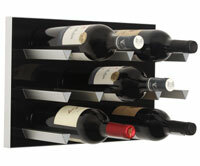 Here at Wineware we’re delighted to be the first online stockists in the UK to take the Vinowall Wine Racks. Click here to view more information regarding the Vinowall.